When it comes to holidays, you have to keep a record of every spot you visited so you can reminisce on the flight home. 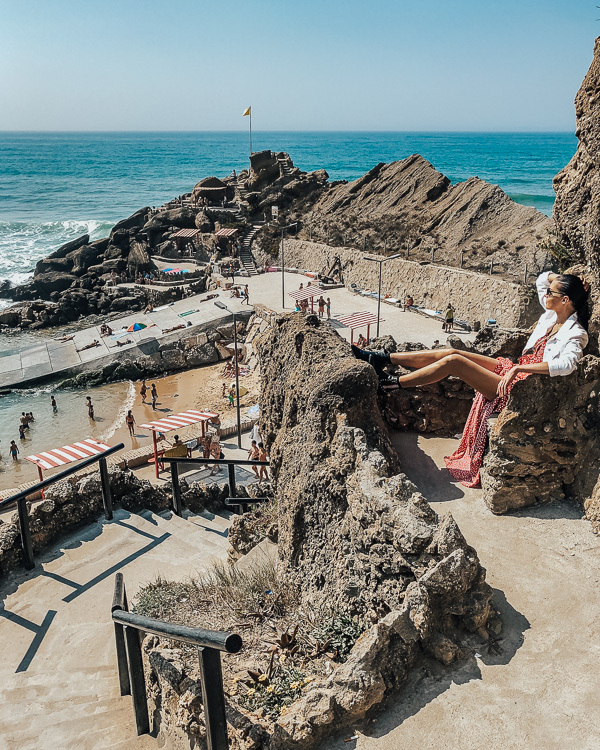 From selfies in front of monuments to jaw-dropping sceneries, certain places simply need a camera’s attention, and these Portuguese spots are no exception. 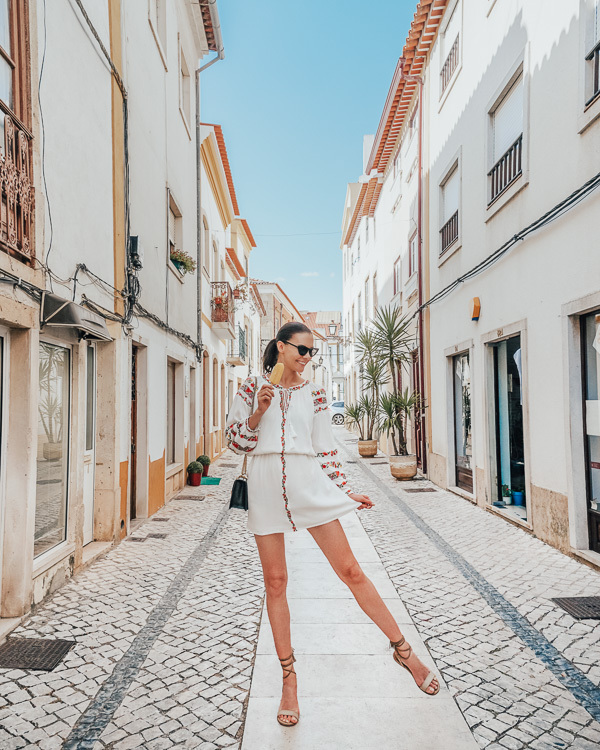 So when you’re planning your next trip to Portugal, be sure to keep these locations on your checklist and your camera ready; your Instagram feed will be thanking you! Seek, and you shall find! 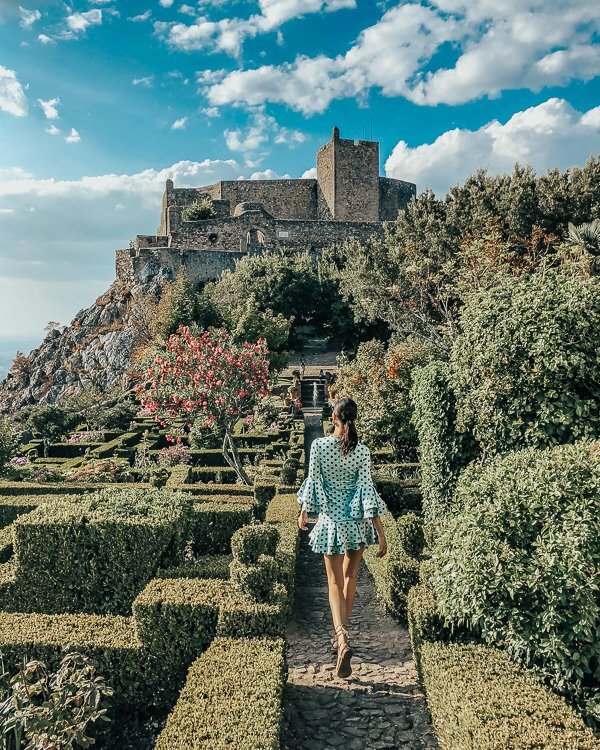 After winding your way through the gardens, exploring the 17th-century city square and ancient castle, you’ll have a plethora of snaps for your Insta. This impossibly photogenic town is filled with mesmerising historical artefacts and eye-watering sceneries. Take tours along the cobble-stone streets, and revel in the jaw-dropping view upon the roof of the palace. After spending a day in this heavenly spot, your feed will be raking in the likes. Stripes by the sea never looked so good. 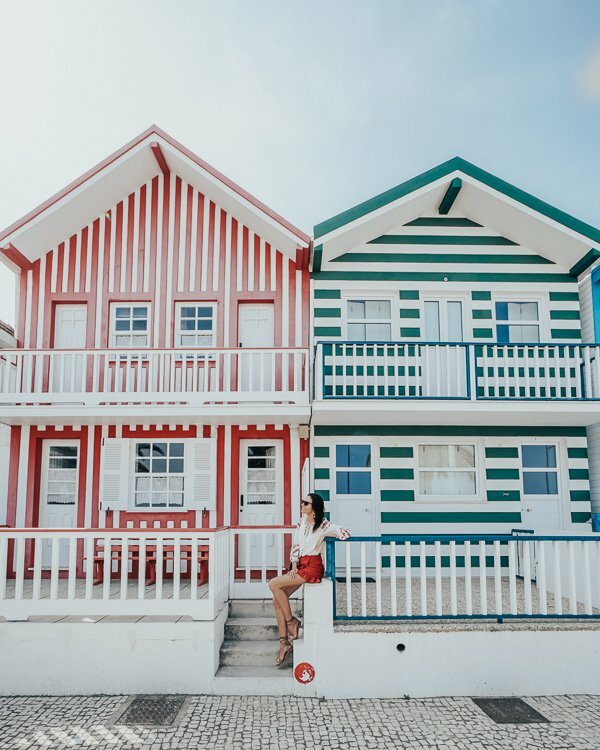 The fishing town of Costa Nova is surrounded by colourful beach houses, known as a palheiro and is encompassed by the ocean, and filled with fantastic photo opportunities. Popularised in the 19th century, the coastal region was inhabited by Portuguese fishermen who started renting out their palheiros in the summertime. This quirky and delightful beach spot is perfect for taking snaps for your collection. You can’t get bolder than taking a shot with these beautiful houses! 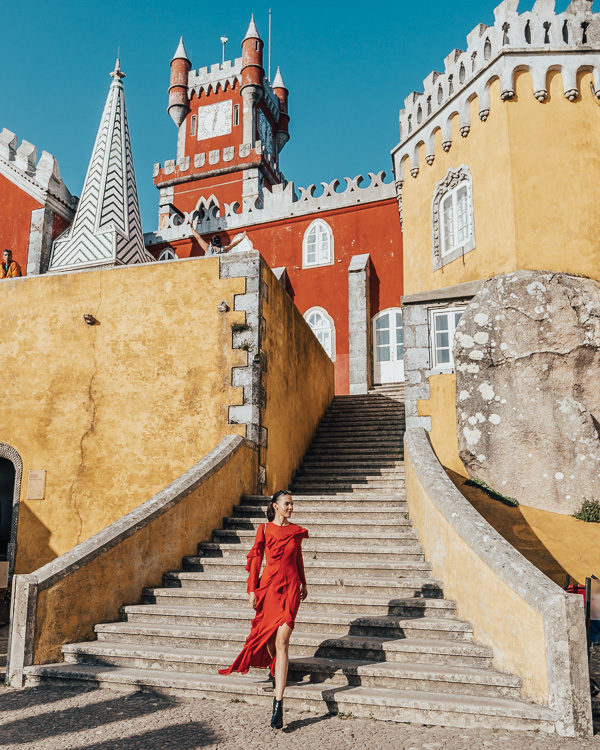 Feel like royalty for a day when in Sintra by visiting Pena Palace. Located on the peninsula this loud and proud castle is the perfect spot to grab your next shot. 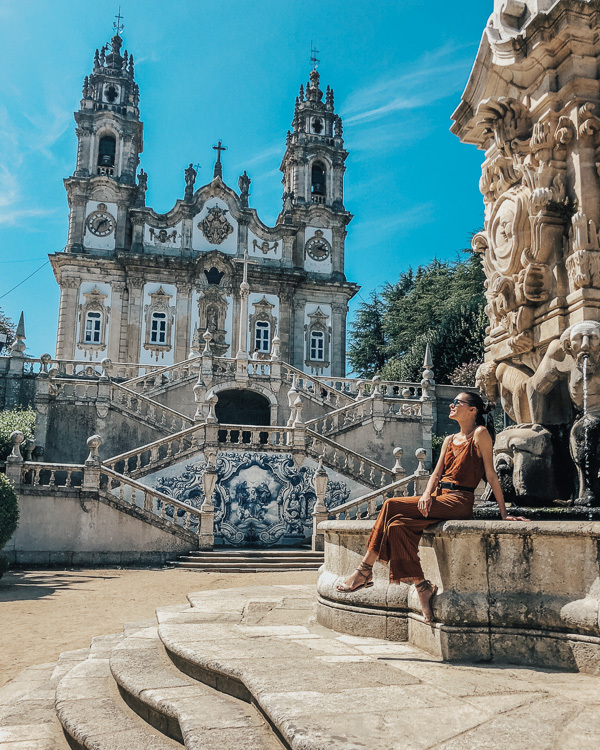 Its history dates back to the middle ages and was completed in the 19th century, but is now used as a meeting spot for the President of the Portuguese Republic. 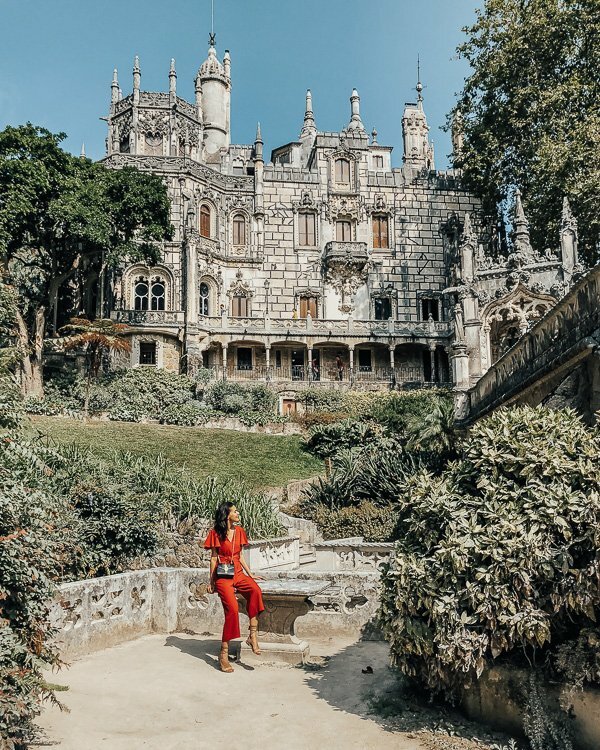 The distinctive colours of this historic location stand out like a dream amongst the city of Sintra; the buttery and cherry shades of the buildings look breathtaking in photos. Be sure to check out their ravishing gardens and the stunning view of the royal residence upon the hilltop. From one jaw-dropping spot to another, Monsaraz is the location for the history buff. This ancient medieval town is one of Portugal’s oldest villages, with a perfect view to boot. From the pure white cobble-stone streets to the incredible view of Alqueva Lake, you can immerse yourself in this magical town without lowering your camera. A photo opportunity at every corner, and as soon as you take your first step, you’ll feel as if you’ve walked into a time machine. When visiting Portugal, you can’t go past the Quinta da Regaleira without taking a few pictures. The palace, much like the Alcobaça Monastery, is vastly intricate and Gothic in style. Surrounded by grottos, gardens and caves, this historic location is the perfect spot to capture memories. Take photos by the exquisite gardens or in the winding and mysterious Labyrinthic and Eastern grottos. There are so many places to discover in this magical location, so why not bring your camera along and seize every moment? 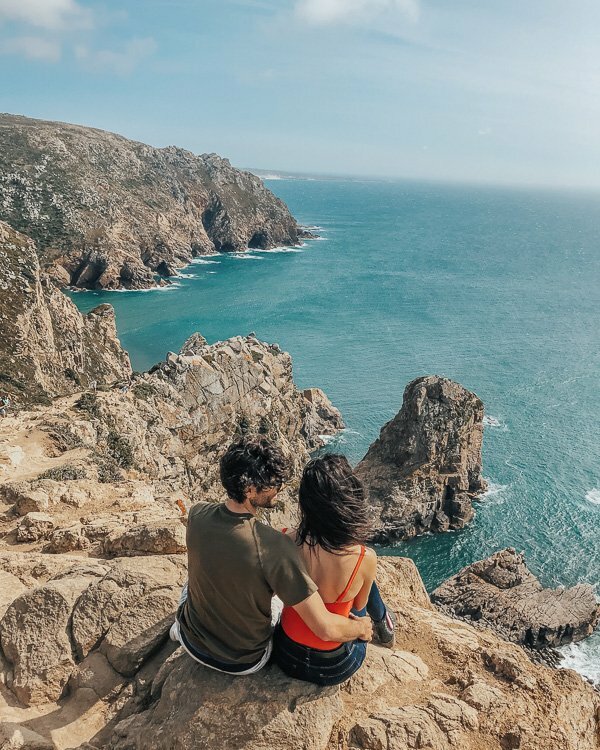 For those who are seeking adventure, Cabo da Roca is the destination for you. This beachfront offers a wild, rugged view and is the best place to capture something special for Instagram. With its jagged cliff face and clear blue seas, you won’t be able to escape the photogenic nature of this Portuguese coastal town. While there are only a few sightseeing spots in this seashore, the scenery is all you need to capture your attention. For the best snapshot, opt for a summer’s day and head to the lonely lighthouse and monument upon the hilltop. Head to the centre of Portugal to experience one of the most photo-worthy locations. The town of Tomar offers a mixture of medieval architecture, tranquil parks and beautiful streets. Everywhere you turn you’ll find the perfect spot for a photo, so be sure to keep your camera at the ready. This Portuguese city hosts a myriad of festivals and events and isn’t afraid to inject some colour into everyone’s day. It’s even rumoured that there’s a secret passageway between the Church of Santa Maria dos Olivais and the Castle. With so many hidden treasures around, you’re sure to capture some incredible moments! Lagos is the cherry on top of the cake when it comes to photogenic locations. Portugal’s stacks of yellow and red limestone cliff faces are just the beginning for this seaside city. Spend a day soaking up the sun rays on their picturesque beaches, and explore the whitewashed streets and the 16th-century wall that encloses the village. This bustling coastal town is home to some of the most beautiful sights, so it would be rude of you not to take some memories of it home with you on the camera. 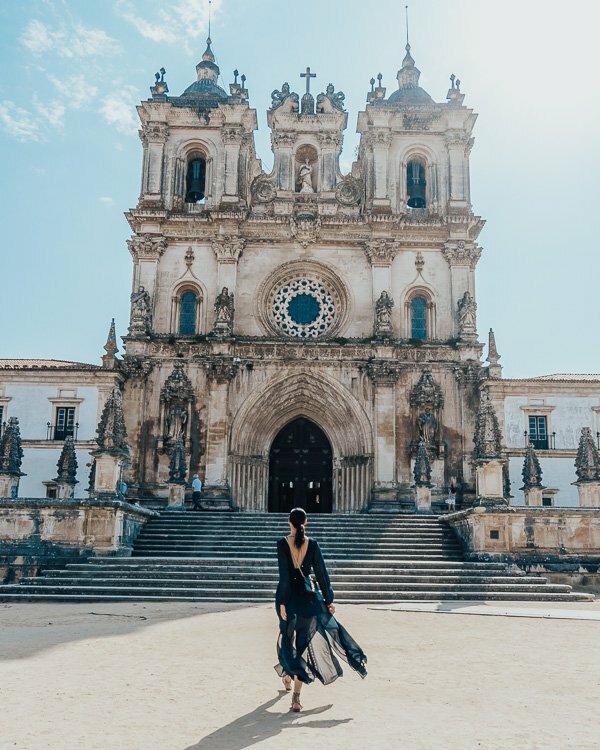 For the history lovers, you can’t get a better spot for a photo than Alcobaça Monastery. This is the first Gothic cathedral in Portugal, and the architecture will take your breath away. It was consecrated in 1252 and remains one of the most historically significant buildings in the country. This location is a phenomenal choice if you’re feeling snap-happy; the ornate detailing of this amazing monastery will knock everyone’s socks off! 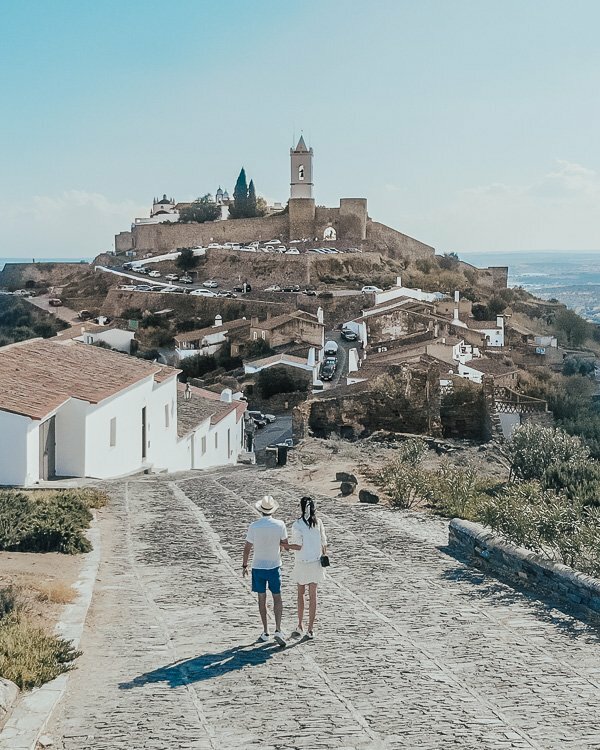 Step back in time and experience a monument like no other at Castelo de Montemor-o-Novo. 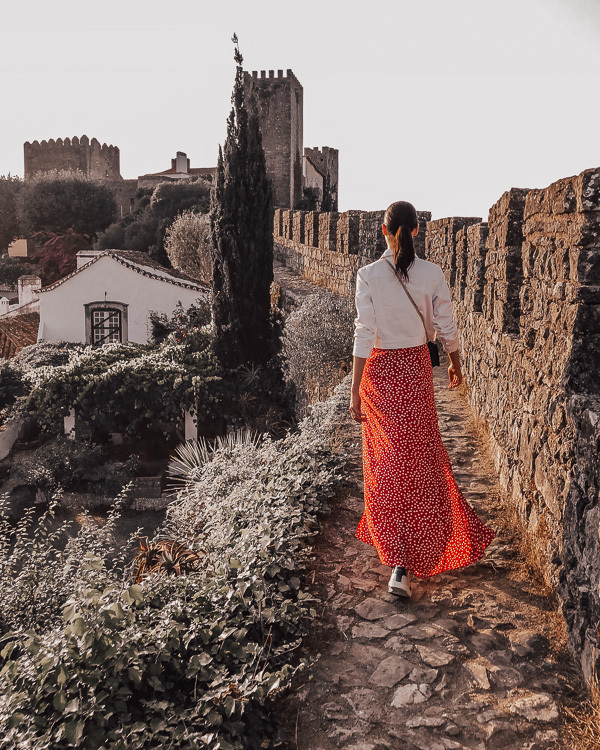 The ancient castle dates back to the 13th century and remains one of Portugal’s most popular attractions. Walk around the site and capture snaps of the beautiful 16th-century guardhouse, castle walls or the surrounding gardens; there are neverending photo opportunities at this incredible spot! 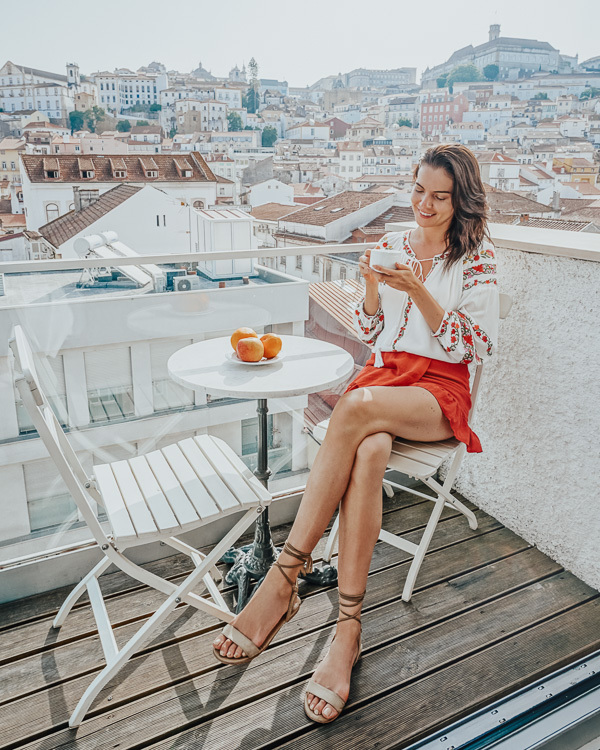 From watching the stunning sunset over the mountains to the impressive cityscape, Coimbra is one of the places in Portugal that you simply can’t miss. This photogenic city sits alongside the Mondego River, home to the Ancient Roman aqueducts and cryptoporticus. Surround yourself with its spectacular medieval architecture, stoned streets and, of course, the picturesque tiled rooftops. This populous city offers parks and phenomenal churches and cathedrals; they host festivals and events annually, so you’re sure to be a part of something worth capturing! This serene and stunning villa is one of the best locations in Portugal to see. Situated on a hilltop on the Portuguese coast the city offers jaw-dropping views of medieval architecture. Whether you walk through the cobblestone streets, squares, castle or the wall that wraps around the town, you’ll want to stay there forever, taking pictures of everything you see. Take a stroll along the ancient wall and snap photos surrounded by the entrancing views that this magical city has to offer. There are so many amazing places to get the pristine shot, so don’t settle for anything other than perfection! Enjoy some of the oldest architecture that Portugal has to offer at the Castelo dos Mouros. The 8th-century wall features a chapel, castle and other narrow entrances, giving you countless photo opportunities with every step. 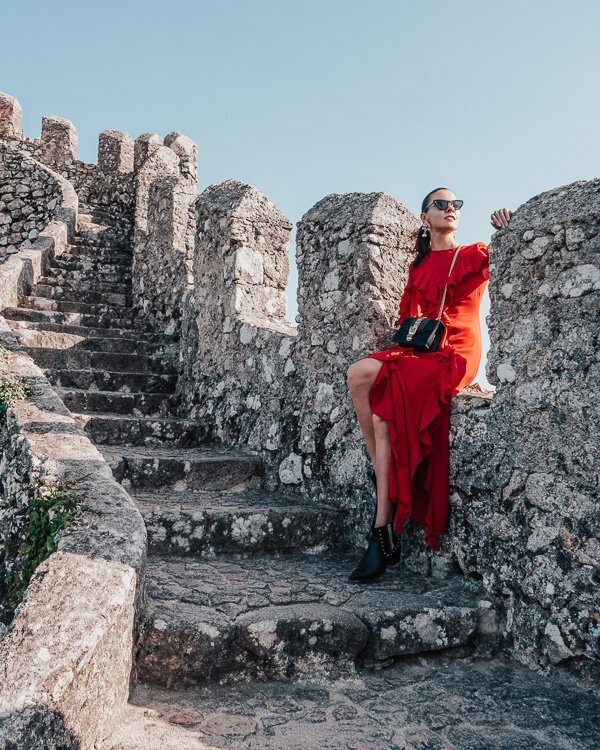 Situated on the hilltop of the Sintra Mountains, you can capture the perfect moment at any time of day; sunsets and sunny days look extraordinary. Unwind and enjoy the beautiful surroundings of Serra da Atalhada. This Instagrammable location is an ideal spot to capture snaps and share them to the world. Encapsulated by windmills, this little town is the destination for rustic and divine images. To seize a perfect Portuguese shot, opt to visit the picturesque area during warm days; the sunny blue sky will contrast effortlessly against the charming and snap-worthy windmills. A stretch of sand never looked so good. 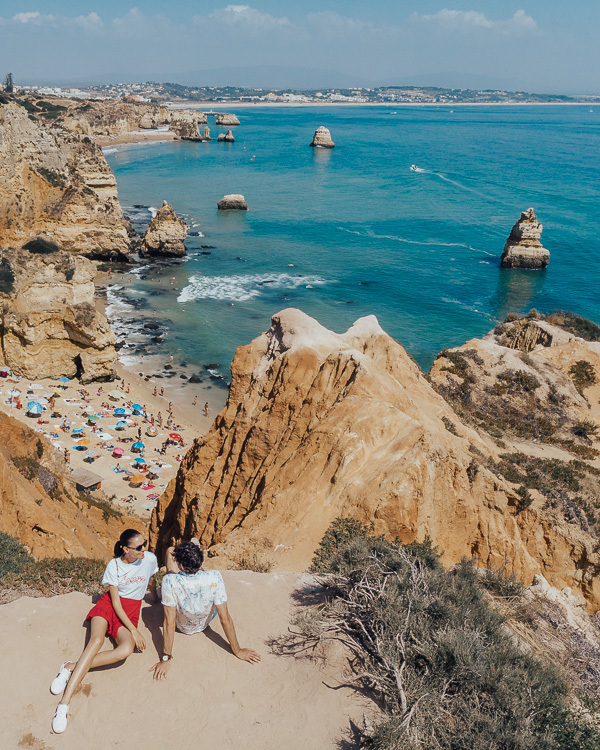 Praia de Santa Cruz offers endless opportunities for you to seize that flawless Instagram picture. From its pure blue water to the architecturally-structured cliff face, this isn’t just a beach; it’s borderline paradise. Enjoy the panoramic views from the sweeping mountain tops and the piercing blue ocean; everywhere you turn you’ll find your next potential photo. Picturesque and breathtaking, the Convent of Christ in Tomar is just begging you to take its photo. Built in a Manueline style the 12th-century exterior is dripping in elaborate decorations, while the interior’s ornate Gothic gold embellishments will keep you snap-happy. Their eight 15th century cloisters also make an excellent spot for a little photo shoot. But it’s always important to remain respectful when visiting sacred or holy places such as convents and monasteries. 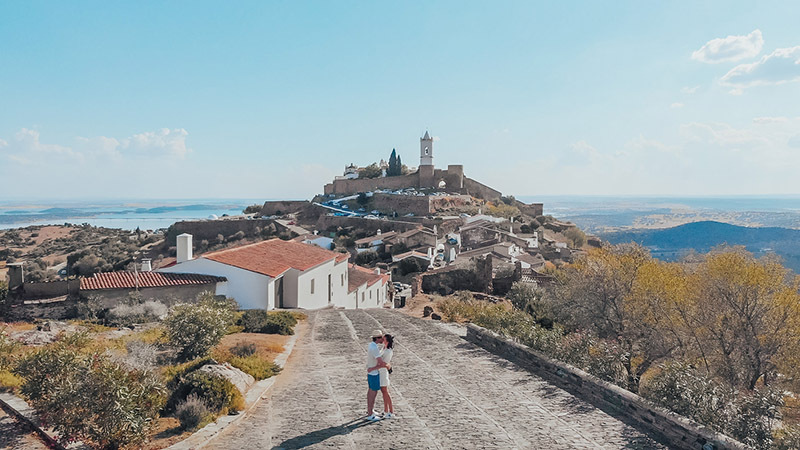 Surrounding the Castelo de Vide is Marvão, which is an overwhelmingly stunning location, that’s packed with places to capture that perfect snap. 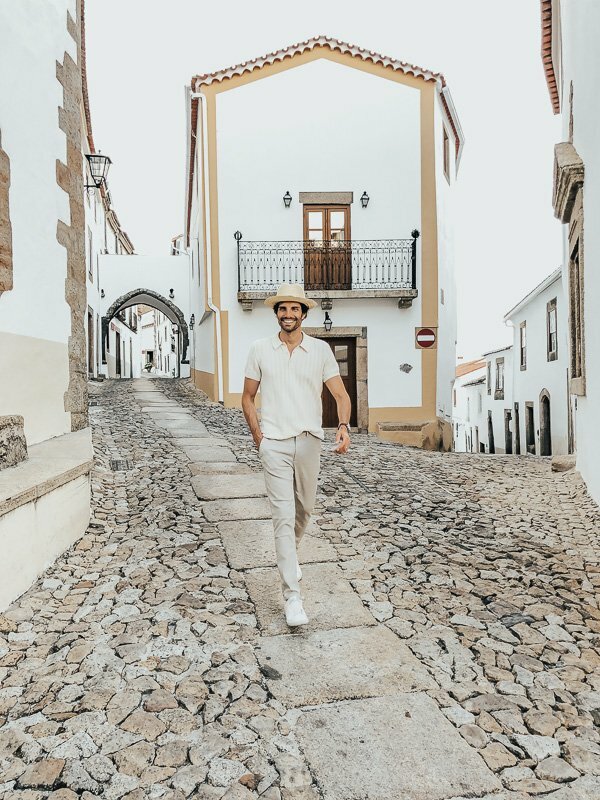 Whether you’re spending the day cruising around the Igreja de Santa Maria or waltzing down the beautiful streets, you’re sure to fill your camera roll with envy-inducing images. 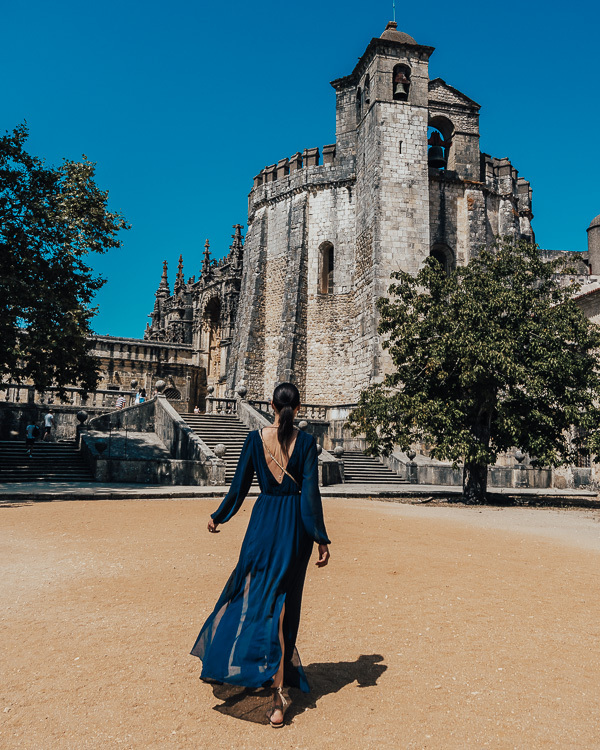 For the ultimate breathtaking sight, be sure to check out the hilltop of the Torre de Menagem, offering a full experience of Portugal’s rich tapestry. Located on the hilltop of Mount St. Stephen, the Shrine of Our Lady of Remedies is one of the most popular destinations in Portugal. Its 18th-century baroque staircase is the perfect spot for a photograph, and the contrast against the intricate exterior of the church with its traditionally painted tiles is sure to get the likes rolling in. With 686 steps this shrine is complete with a sanctuary situated over multiple levels, statues and beautiful architecture. This is a photographer’s dream, so what more could you want? 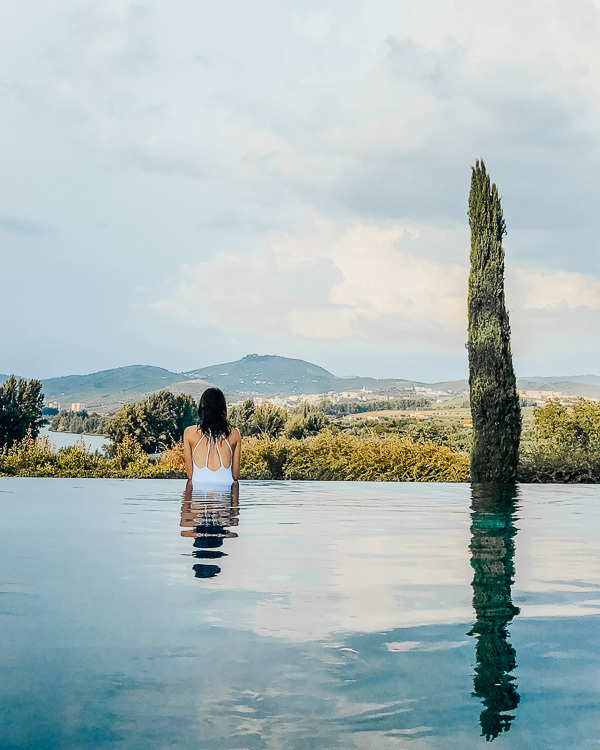 Unwind and engulf yourself in the beautiful surroundings of Duoro Valley. This northern Portuguese location dates back centuries and is a must-see on your holiday checklist. Be sure to visit the spot in the warmer months, giving you the ripe opportunity to capture the blossom in the region’s vineyards. If you’re a budding photographer, opt for a visit in late October so you can witness the golden transformation of the slopes as they transition into autumn. There isn’t a spot where you can’t take a great picture in this province; everywhere you turn, you can take the perfect photograph. Who wouldn’t want to stay in a medieval castle on holiday? Pousada Mosteiro do Crato is an architectural masterpiece, located on the northern edge of the Alentejo region. Its Monastery is one of the most emblematic works of the region and original Gothic buildings in Portugal. Now converted into a hotel, this 14th-century palace is practically asking you to take its picture; how could you say no to that view?